Geography is the study of the Earth, including its physical features, atmosphere and resources. Antipodes - Two points that are on the exact opposite sides of the earth, for example, the North and South Poles. Archipelago - A group of islands, for example, the Bahamas. Atoll - A ring of coral that makes an island, for example, Lighthouse Reef near Belize. Basin - A section of land eroded by water, causing it to be lower than the surrounding land. Bay - A small body of water enclosed partially by land, for example, Hudson Bay in Canada. Butte - A hill with a flat top and steep sides, for example, Merrick's Butte in Arizona. Canal - A waterway made by man for irrigation or easier transportation, for example, the Suez Canal. Canyon - A valley that is deep and has steep sides, for example, the Grand Canyon. Cape - A section of land that juts out into the water, for example, Cape Cod. Cave - A large open area in the ground or in the side of a mountain or hill, for example, Mammoth Cave in Kentucky. Channel - A narrow stretch of water between to larger bodies of water, for example, the English Channel. Cliff - A step rock face many times found by the ocean, for example, the White Cliffs of Dover. Continent - A large land mass, for example, Africa. Cove - A small bay that is sheltered and shaped like a horseshoe, for example, Coron Island Cove in the Philippines. Delta - The area at the mouth of a river formed with deposits brought down the river, for example, the Ganges Delta in India. Desert - An area with little rainfall and sparse vegetation, for example, the Sahara Desert. Dune - A hill made of sand, for example, the White Sands in New Mexico. Estuary - The area where the fresh water from a river meets the salt water from an ocean, for example, the Amazon Estuary. Fjord - A long narrow inlet between steep cliffs, for example, the Lysefjord in Norway. Geyser - A hot spring that occasionally send up a column of water and steam, for example, Old Faithful in Yellowstone Park. Glacier - A large mass of ice that moves slowly, for example, the Easton Glacier on Mount Baker. Gulf - An area of ocean partially surrounded by land, for example, the Gulf of Alaska. Hill - A raised mound of land, for example, the Chocolate Hills in the Philippines. Ice shelf - A platform of ice floating near the coast, for example, the Ross Ice Shelf in Antarctica. Island - A piece of land totally surrounded by water, for example, Crete in Greece. Isthmus - A narrow strip of land that connects two larger land masses, for example, the Isthmus of Panama. Lagoon - A body of water that is not very deep with a sandbank or strip of land separating it from the ocean, for example, the Blue Lagoon in Iceland. Lake - A large body of water totally surrounded by land, for example, Lake Titicaca in the Andes. Marsh - A wetland near lakes and streams, for example, the Macoun marsh in Ontario, Canada. Mesa - A large land formation that is flat on top and has steep sides, for example, Tucumcari Mountain in New Mexico. Mountain - A very tall landform, for example, Mt. Everest in the Himalayas. Oasis - An area in a desert that has water and vegetation, for example, the Siwa Oasis in Egypt. Ocean - A very large body of salt water, for example, the Atlantic Ocean. Peninsula - An area of land surrounded on about three side with water, for example, Italy. Plain - Flat areas of land, for example, the Great Plains in North America. Plateau - A tableland that is fairly flat, for example, the Tibetan Plateau. Pond - A small body of water surrounded by land, for example, Walden Pond in Massachusetts. Prairie - A large flat area with grasses and few trees, for example, the Midewin National Tallgrass Prairie in the United States. 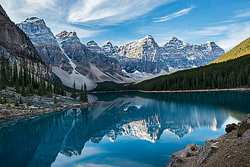 Range - A series of mountains, for example, the Appalachian Mountain Range. Reef - A growth of coral under the sea and near the surface, for example, the Great Barrier Reef in Australia. River - A large body of water that flows, for example, the Nile River. Sea - A large body of salt water, for example, the Black Sea in Europe. Strait - A strait is a narrow body of water that connects two larger bodies of water, for example, the Strait of Gibraltar. Swamp - A freshwater wetland with muddy land, for example, the Amazon River floodplain. Tributary - A river that flows into a larger river, for example, the Missouri River is a tributary of the Mississippi River. Tundra - A flat, treeless area where the soil if permanently frozen, for example, the Greenland Tundra. Valley - The low area between mountains, for example, the Rio Grande Valley. Volcano - A mountain with a vent where lava, steam, and ash comes out, sometimes violently, for example, St. Helen's. Waterfall - Water falling from a height, usually off a cliff or side of a mountain, for example, Niagara Falls. All of these terms show different examples of geography. "Examples of Geography." YourDictionary, n.d. Web. 23 April 2019. <https://examples.yourdictionary.com/examples-of-geography.html>.